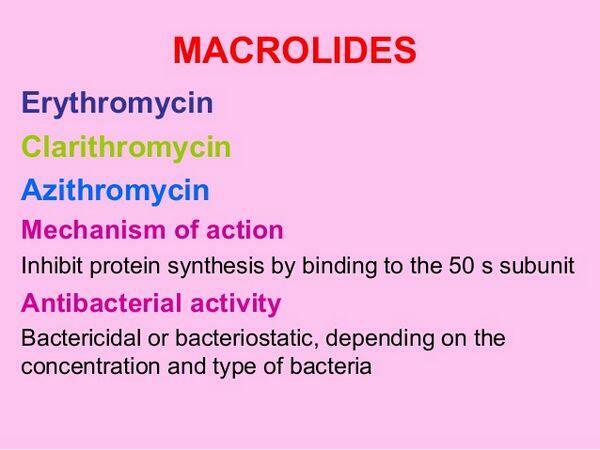 Macrolides inhibit bacterial protein synthesis. They demonstrate excellent activity against atypical organisms (Mycoplasma, Chlamydia, and Legionella species), but their activity against typical pathogens (H. influenzae and S. pneumoniae) is variable. 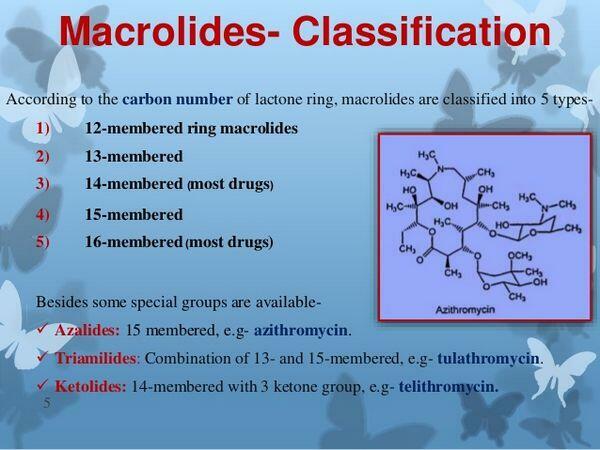 Macrolides are indicated for use in acute exacerbations of chronic bronchitis and are typically used as first- and second-line agents for this indication. They are available in oral and parenteral formulations. The advanced-generation macrolides have serum half-lives that are much longer than earlier-generation agents, allowing for once-daily dosing. In addition, the newer macrolides demonstrate better activity against S. pneumoniae and excellent distribution into respiratory tissues. Side effects, particularly of the early macrolides, are associated primarily with the GI tract (e.g., abdominal cramps, nausea, vomiting). Hypersensitivity reactions are rare. 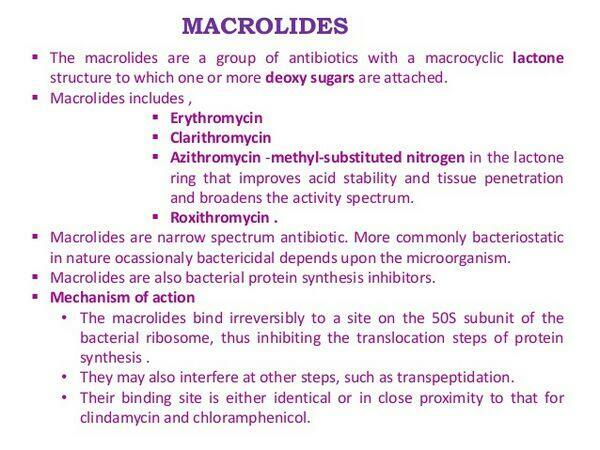 The advanced-generation macrolides have a lower incidence of side effects than the older agents. The prevalence of macrolide resistance has increased dramatically over the past two decades. Geographically, it is highest in the Asia/Pacific region with 73% resistance in Japan and 81.5% in Hong Kong. In Europe, France (47%) and Italy (42%) have a high prevalence of resistance, while 19-34% of pneumococci are macrolide resistant in the United States. Macrolides act by binding to the 23S ribosomal RNA (rRNA) in the 50S subunit of the ribosome. Binding to the 23S rRNA inhibits the translocation of RNA during protein synthesis and blocks bacterial protein synthesis. Erythromycin (Lilly/Shionogi's Ilosone, Abbott's Erythrocin, generics) is the class standard macrolide that has been available since the 1950s. The agent has been widely utilized for respiratory tract infections, but the next-generation macrolides, which provide more-convenient dosing and expanded spectrum, have replaced this agent for more-severe respiratory infections such as community acquired pneumonia (community-acquired pneumonia) and acute exacerbations of chronic bronchitis. The agent is available in both oral and parenteral formulations. Erythromycin acts by binding to the 50S ribosomal subunit of susceptible microorganisms, resulting in inhibition of protein synthesis. Erythromycin is active against a range of gram-positive, gram-negative, and atypical organisms. However, many strains of H. influenzae and S. pneumoniae are resistant to erythromycin. Early studies of erythromycin demonstrated its efficacy in respiratory tract infections. A double-blind, randomized Phase III clinical trial compared the safety and efficacy of dirithromycin (Lilly's Dynabec) (500 mg once daily) and erythromycin (250 mg orally four times daily) in the treatment of either acute bacterial bronchitis or acute bacterial exacerbations of chronic bronchitis. The trial included 1,222 patients (529 with acute bronchitis and 693 with acute exacerbations of chronic bronchitis). Of this number, 135 patients with acute bronchitis and 202 patients with acute exacerbations of chronic bronchitis were evaluable. In acute exacerbations of chronic bronchitis, the drugs were also effective with 98.7% and 95.0% cure or improvement at 10-14 days post-therapy for dirithromycin and erythromycin, respectively. Pathogen eradication rates were 75.3% in both treatment groups. There were no statistically significant differences in clinical and bacteriological results between treatments in patients with acute bronchitis or acute exacerbations of chronic bronchitis. Of the 1,222 patients included, no significant differences were observed in the number of patients reporting adverse events. There were 9 early discontinuations due to adverse events in the dirithromycin group and 14 in the erythromycin group. Erythromycin is associated with GI side effects in about 20% of patients, causing physicians to shift to the newer macrolides. Clarifhromycin (Abbott's Biaxin, Biaxin XL/Klacid, Taisho's Clarith) is an advanced-generation macrolide commonly used for multiple respiratory tract infections, including community-acquired pneumonia, acute exacerbations of chronic bronchitis, otitis media, and sinusitus. This product is available in tablets, extended-release tablets, and granules. Clarithromycin acts by binding to the 50S ribosomal subunit of susceptible microorganisms, resulting in inhibition of protein synthesis. Its spectrum of activity includes a range of aerobic and anaerobic gram-positive and gram-negative microorganisms; similar to other macrolides, clarithromycin is highly active against atypical pathogens such as Mycoplasma pneumoniae. Clarithromycin is potent against staphylococci and streptococci and has modest activity against H. influenzae. Several trials have evaluated the efficacy of clarithromycin in acute exacerbations of chronic bronchitis. In one multicenter, randomized, investigator-blinded, randomized Phase III study, 287 subjects with acute exacerbations of chronic bronchitis were treated with either clarithromycin extended-release (two 500 mg tablets once daily for seven days) or amoxicillin/clavulanate (one 875 mg tablet twice daily for ten days). The clinical efficacy was comparable between the two groups, with the clinical cure rate of 85% for clarithromycin compared with 87% for the amoxicillin/clavulanate group. Clarithromycin achieved a bacteriological cure rate of 92% compared with 89% for the amoxicillin/clavulanate group. Amoxicillin/clavulanate had a higher discontinuation rate related to side effects (6%) compared with clarithromycin (1%). Adverse events generally occurred with a similar frequency in the two treatment groups. Azithromycin (Pfizer's Zithromax/Zitromax) is widely used for the treatment of respiratory tract infections, including acute exacerbations of chronic bronchitis. Azithromycin is available in both oral and IV formulations. The agent is recognized for its broad efficacy, dosing advantages, and favorable side-effect profile. Azithromycin has become the leading macrolide in the United States owing to its high safety, long half-life (allowing for a short treatment course), and excellent promotion by Pfizer. Azithromycin acts by binding to the 50S ribosomal subunit of susceptible microorganisms and interferes with microbial protein synthesis. It demonstrates in vitro activity against a wide range of bacteria, including gram-positive bacteria such as S. pneumoniae and gram-negative bacteria such as H. influenzae. Azithromycin demonstrates cross resistance with erythromycin-resistant gram-positive strains and most strains of methicillin-resistant staphylococci. In a randomized, double-blind, controlled Phase III clinical trial in acute exacerbations of chronic bronchitis , azithromycin (500 mg once daily for three days) was compared with clarithromycin (500 mg twice daily for ten days). The primary end point of this trial was the clinical cure rate measured at days 21-24. For the 304 patients analyzed at the day 21-24 visit, the clinical cure rate for three days of azithromycin was 85% (125/147) compared with 82% (129/157) for ten days of clarithromycin. In the safety analysis of this study, the incidences of treatment-related adverse events, primarily GI, were comparable between treatment arms. Azithromycin is rapidly and extensively taken up by leukocytes, which deliver the drug to the site of infection, where the drug maintains high sustained concentrations. In addition, azithromycin has a long half-life (68 hours) allowing for its convenient five-day dosing regimen. Azithromycin also offers excellent tolerability, with a low incidence of adverse events. This drug compares favorably with amoxicillin/clavulanate and other competitive agents from a side-effect and tolerability standpoint. The most common side effects are diarrhea/loose stools (4-5%), nausea (3%), and abdominal pain (2-3%); the overall discontinuation rate is 0.7%.